In the midst of recent terrorist attacks, historians of the United States Capitol last year marked the 100th anniversary of an event that literally shook the foundations of the building. On July 2, 1915, life on the Hill was suddenly and dramatically disrupted when a bomb exploded in the Senate reception room. In the context of a nation on the edge of involvement in World War I, the bombing appeared to represent the actions of terrorists and was widely reported in all the major papers of the country. Public suspicion increased when, within a few days, it became known that the bomb maker and individual who set it off was Frank Holt, a German-born academic at Harvard and Cornell universities who earlier had used the name Erich Muenter. Over the years, the full details behind the 1915 bombing have only slowly come to light. A wide variety of scholars have sought to clarify them and render an interpretation, but this has not been an easy task. As recently as 2013, social psychologist and blogger Romeo Vitelli stated that “the only conclusion anyone can make about Professor Erich Muenter is that he is much an enigma in death as he was in life.” However, popular historical writer Howard Blum appears to hold a different view; in Dark Invasion, also published in 2013, he tells the story in detail and provides a convincing context for understanding the 1915 bombing of the Capitol. The details that should be of most interest to readers involve the damage caused to the Capitol and the effect it had on the international politics and rising war-fever of that day. 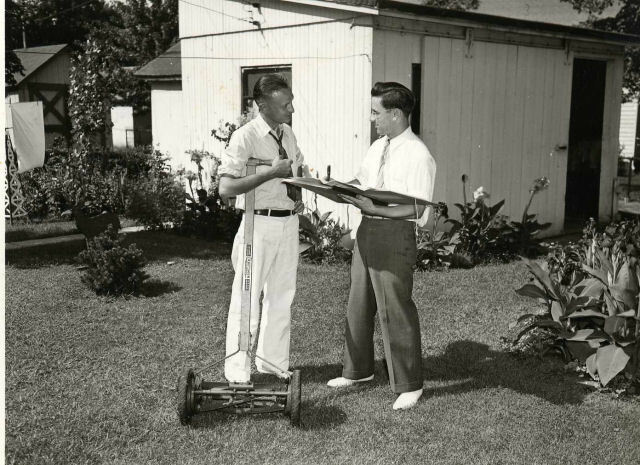 As shown in the accompanying photograph, the bomb’s toll was minimal. While the Senate’s reception area was destroyed, there was little collateral damage elsewhere in the building. Because Muenter set the bomb to go off around midnight, there were no injuries. The noise from the explosion was heard all over Capitol Hill and caused much alarm, but with no follow-up, the public’s fear quickly subsided. The general consensus among scholars is that the bombing did not accelerate American involvement in the war then underway in Europe. The July 2, 1915 bombing of the Capitol, by itself, emerged in part as an isolated event by a lone individual. At the same time, as Howard Blum’s book reveals, German terrorist cells operated in the United States during this period. Erich Muenter/Frank Holt’s actions can be see as part of that broader effort. After the bombing of the Capitol, for example, Muenter/Holt attempted to assassinate J.P. Morgan, Jr., who he saw as the main force behind the shipping of war materials to the Allies fighting Germany. Morgan survived the attack. Muenter/Holt also placed bombs on U.S. ships bound for Europe. Those efforts also failed, but their attempt reveals that Muenter/Holt could have done much more damage than he did, a troubling prospect at the least. Making his life all the more complex and puzzling, Muenter was also guilty of the 1906 murder of his wife, a systematic user of aliases, and he had exhibited other violent behavior. His death by suicide, which came shortly after his arrest, has made the investigation of his origins and life in the United States difficult to draw more informed insights into the man. His actions in Washington and New York did help federal authorities track down and bring to an end German espionage within the country. In the end, this story reminds us that Americans have successfully faced down terrorism many times before in our history. Awareness of that fact should bolster our resolve as we confront it again in today’s more complex world. As noted, the 1915 bombing is extensively covered in Howard Blum, Dark Invasion: 1915: Germany’s Secret War and the Hunt for the First Terrorist Cell in America (2013) and now available as a Harper paperback. In an early effort to tell the story of Erich Muenter’s evolution into Frank Holt, The Harvard Crimson in 1942 carried a brief account, no author listed. Romeo Vitelli’s analysis in his fascinating website Providentia on the event (Parts I and II, April 21, 28, 2013) explore the psychological underside of Muenter/Holt’s personality as a terrorist. Clearly, the event, the man, and the circumstances continue to invite interest and commentary. When Pope Francis addresses a joint meeting of Congress this week, he will add his name to a roster of approximately 250 foreign visitors who have enjoyed the same distinction, under the widest conceivable variety of circumstances. Some have come in peace time, while others have come to strengthen bonds of wartime alliance. Some have come to buttress failing regimes, while others seek to validate a change in regimes. In the 19th century, most visits involved the invited speaker addressing each chamber separately. Since then, invited dignitaries have almost always addressed joint meetings of Congress. Joint sessions are much more rare, and to date have included the French ambassador’s visit in 1934 to warn of the rise of Nazi Germany, Winston Churchill’s famous visit less than three weeks after Pearl Harbor, and the less famous visit of Cuba’s ambassador in 1948. The frequency of European dignitaries has also changed, declining in favor of a rising proportion of invitees from Asia or South and Central America. Most people know that the Marquis de Lafayette was the first foreign dignitary to address Congress, in 1824. His portrait, paired with Washington’s on the other side of the Speaker’s rostrum, is a memento of that trip—which was itself a memento of his participation in the American Revolution fifty years earlier. The next visitor was also a private citizen: when Louis Kossuth addressed the House and Senate (meeting separately) in January 1852, the exiled leader of Hungary’s ill-fated Revolution of 1848 was looking to raise political clout (and money) for a comeback back home. All but a handful of the rest of the foreign dignitaries invited to address Congress were government officials: either heads of state (emperors, kings, or presidents), or heads of government (chancellors or prime ministers) or their personal representatives (envoys or ambassadors. The few foreign legislators to address Congress were all members of Japan’s Diet, or Parliament, serving as personal envoys of their prime minister in the years after WWII). The visit by Madame Chiang Kai-Shek was the first by an individual who had never held any political office; her dramatic appeal on behalf of her husband, the Generalissimo, sought to stir fresh sympathy and aid in to China’s lonely fight against the Japanese in the darkest days of 1943. The symbolic value of these visits can hardly be overstated—even in the sober calm of historical retrospection. When political leadership combines with moral leadership, the effect can be electrifying. Lech Walesa, head of Poland’s Solidarity labor union, addressed Congress in November 1989. When Vaclev Havel, President of Czechoslovakia, took the podium just two months later, their “one-two punch” in support of the “Velvet Revolution” helped speed the dissolution of the Soviet Empire and eventually of the Soviet Union itself. Similarly, Nelson Mandela’s visit as Deputy President of the African National Congress in June 1990, just months after South Africa’s government lifted its ban on the party, added international legitimacy and momentum to the anti-apartheid movement. Francis’s visit to the United States this week, and his formal visit to Congress on Thursday morning, is an example of political and moral leadership combined in one person. As “Supreme Pontiff of the Universal Church,” the Pope can only be said to exert pastoral authority over a community of religious believers. But since the Lateran Accords with Mussolini’s Italy in 1929, the Pope is also “Sovereign of the Vatican City State.” No matter that Vatican City is only 110 acres—the smallest internationally recognized independent state in the world (and Europe’s only absolute monarchy); it is enough to make him a “head of state.” In either capacity, he would have merited an invitation to Congress. In both capacities, the visit galvanizes the attention of Americans, millions of whom will no doubt be watching the Pope’s speech to Congress on live television. And in the long tradition of world leaders who have beaten a path to Capitol Hill over the past 190 years to draw attention to common concerns and aspirations, Francis may fulfill the meaning of yet a third title claimed by the Popes since the fifth century: “Pontifex Maximus,” or the great bridge-builder. In my classes, I can often tell when the students think I am pushing something that they are not so sure about. So recently, when I asked them to review The Frieze of American History, located under the great dome of the U.S Capitol, for insights into understanding the contemporary conditions faced by Native Americans, I quickly sensed their resistance. Why look to a nineteenth-century panel of historical settings on American history for answers into today’s world? Not an unreasonable question, I thought. Why would one use valuable class time examining a set of images which, at first glance, appear to romanticize, even denigrate, the role of American Indians? It was my intent, I said in response, to demonstrate that at the very center of federal power, located within the building that houses Congress, there exists examples of historical images which still resonate and convey meaning for the twenty-first century viewer. Their question, however, forced me to examine more carefully my proposal and, as a result, we were able to develop a deeper insight into our collective, evolving sense of national identity. The nineteen panels of the much viewed frieze, a circular painting made to appear as sculptured stone and located just below the windows in the dome, represent a much larger story too complex to tell in this blog. Suffice to say that Constantino Brumidi, an Italian immigrant sculptor retained by General Montgomery Meigs to provide art and decorations for the interior of the Capitol, created the original sketch or the panels in 1859. After a lengthy delay due to the Civil War and Reconstruction, Brumidi began work in 1877 on a series of portrayals of important events in American history. With his death in 1880, the task was taken up by Filippo Costaggini who completed the final eight panels based on the original plan for the frieze. Upon reviewing the Architect of the Capitol’s on-line images of the frieze panels, my students were able to see how the Native American experience was well represented in the panels. To narrow our focus, however, I asked them examine closely the 1884 panel entitled The Death of Tecumseh to demonstrate how time and context can change the meaning of artistic representations. In this dramatic scene, based on the Battle of The Thames which occurred in 1813 in Canada when American and Indian fighters fought, the panel depicts the fighting while off to the side a wounded Tecumseh lies dying. As historical tableaux, the panel signifies the Americans winning a decisive battle against an enemy who sought to block their movement westward. The panel documents the original vision that Brumidi had in creating the frieze sketch, the artistry of Costaggini, and the popular belief held then that Indians stood against the emergence of the American nation. With that in mind, I asked my students what had changed since 1884 with regard to the panel? At first we talked of how, over time, constructed images of the past often undergo a period of deconstruction, a rethinking of what they symbolize. Later generations then may reconstruct the meaning of the image to allow for social and cultural changes. Using that format, we concluded the since the creation of the panel, the death of Tecumseh had evolved from that of a fallen enemy to an individual who fought for Indian rights. As the first Native American leader to call for an inter-tribal confederation to resist American expansion, he is seen today as a forerunner of later Indian leaders who sought to redress the injustices that came with conquest and resettlement on federal reservations. Even more,Tecumseh and his actions are now viewed as integral to understanding our national history, an example of our increasingly diverse and complex American identity. As a class, we concluded that we view the Brumidi images in The Frieze of American History with different eyes than nineteenth-century Americans. The students saw this as a testimony to how culture and perceptions shift over the passage of time. We see Tecumseh as less the slain enemy, more the fallen leader who fought the good battle. He has become more one of us, no longer alien or to be rejected, his life, and death, an important reminder of our broadening sense of nationhood. Monuments and art from another era remain unchanged, as they should, but the context in which they are viewed and the insights they provide do change. In the end, all of us in the class came to realize that this means we have changed as well. On-line sources for this blog can be found at: http://www.aoc.gov/capitol-hill/other-paintings-and-murals/frieze-american-history and http://www.gpo.gov/fdsys/pkg/GPO-CDOC-103sdoc27/pdf/GPO-CDOC-103sdoc27-10-12.pdf. Also, see Barbara Wolanin, Constantino Brumidi — Artist of the Capitol (Senate Document 103-27, 103rd Congress, Session 2, Issued July 11, 2000). The USS Maddox in Australia in 1967. The most memorable and protracted of these proxy wars was Vietnam, which developed in its earliest stages in late 1955. The war reached a new level of intensity on August 10, 1964—fifty years ago this Sunday—when President Lyndon B. Johnson signed into law the Gulf of Tonkin Resolution. Congress had quickly passed this resolution in response to the attack on two U.S. Navy destroyers, USS Maddox and Turner Joy, in international waters by the North Vietnamese on August 2 and 4. With only one representative and two senators voting against the Gulf of Tonkin Resolution on August 7, the level of Congressional mandate behind accelerating the war effort was immense. Above all else, this act gave President Johnson the authority to “take all necessary measures to repel any armed attack against the forces of the United States and to prevent further aggression.” At the same time, this was by no means a formal declaration of war. The Gulf of Tonkin Resolution—to an extent beyond any other Congressional action before it—gave the executive branch more authority to take military action, both conventional and covert. This legacy of the Gulf of Tonkin Resolution has had far-reaching implications for United States foreign policy over the past half-century. The most direct corollaries that have followed the Gulf of Tonkin Resolution are the Persian Gulf, Afghanistan, and the Iraq wars. During the administration of George W. Bush, the decision to go to war in Afghanistan, more so than other wars, is remarkably within the same vein as the Tonkin Resolution. This is primarily due to the fact both of these followed a so-called “black swan” event that galvanized the American people against those who had attacked them. Additionally, both of these wars have inspired a similar sentiment among the American people, as both instances have made the populace discontented with the protracted nature of a war that seems unnecessary to continue. Yet there is perhaps an even more unpopular trend that has developed due to the increased presidential authority first provided by the Gulf of Tonkin resolution. Events such as Jimmy Carter’s actions in Iran, Ronald Reagan’s involvement with the Contras, Bill Clinton’s decision to send troops to Haiti, or even Barak Obama’s use of drones in the Middle East all fall in line with the Presidential authority in foreign affairs outlined by the Gulf of Tonkin Revolution. Each has a decidedly secretive quality independent of Congressional oversight, which often leaves the American people uneasy, if not outraged. Much debate has surrounded what degree of autonomy the president should be given to conduct military operations in the advancement of national interests. In instances such as Pearl Harbor and September 11, it would seem popular mandate seems to afford a large degree of freedom to the president. However, in the absence of such overt attacks on the United States, it is often the case that US military action seems ultimately unsavory. Regardless of whether someone thinks US foreign policy of the past fifty years has been justified or not, the Gulf of Tonkin Resolution has played an important part in shaping how the United States has conducted itself on the global stage. On July 4, 1981, in the hour and half before the Washington Monument fireworks began, thousands of locals and visitors to the city gathered on the U.S. Capitol Grounds to enjoy the always entertaining Pearl Bailey, accompanied by the National Symphony Orchestra, sing patriotic and popular songs. There were also thunderous marches and inspirational readings that night as a national television audience joined over 200,000 at the event. It proved a magical night of music and song. As evening fell, and the sky lit up, the event concluded with cannon firing as the orchestra played Tchaikovsky’s 1812 Overture. A new tradition was born that night, one that continues to this day. Organized and staged by Jerry Colbert and the non-profit Capitol Concerts, Inc. he had founded, the show proved an instant hit. Those at the performance and others watching across the nation registered their approval with comments and support. Such musical occasions have had a long history in the nation’s capital. This event, however, and its continual reoccurrence every year, can be seen as the launching of a new, sustainable, and growing use of the Capitol Grounds and other public spaces in Washington for musical performances. Neil Diamond performs at the 2013 Capitol Fourth concert. This blog will review the origins of that first Capitol Fourth, the long period of gestation which brought it about, and invite readers to respond with their own recollections of the evening. The blog builds off of a large body of existing commentary about the role that the U.S. Capitol and the larger National Mall has played in fostering a broader public appreciation of our country’s musical traditions. The historic roots of the 1981 concert are deep in 19th and 20th century musical performance history. As James R. Heintze has noted, musical concerts on July 4th began in the late 18th century and continued to expand in number over the next two centuries, at first in cities such as New York and Boston and then, after the Civil War, increasingly in Washington. He documents that the tradition of summer concerts was well established in the national capital by the turn of the twentieth century, particularly on the Capitol Grounds. During the first half of the new century, stimulated by the momentous impact of two world wars and the Great Depression, Americans increasingly enjoyed patriotic marches and popular music that sounded sentimental themes and words. In the post-WWII years, the west side of the Capitol Grounds—along with National Sylvan Theater near the Washington Monument—became the focus for a growing number of musical performances. As the Cold War settled in, the call for more concerts with patriotic music increased. Even the 1960s and anti-war protest did not slow the rise of such events, such as in 1970 when Kate Smith sang “God Bless America” at the July 4 “Honor America Day” ceremony in Washington. Throughout the decade, in cities across the nation, summer night concerts with patriotic music provided enjoyment as the sense of national pride grew. From the beginning, Colbert showed a genius for bringing together the technical and logistical support needed to host a live-telecast event that, through the network of PBS stations, would reach a national audience. Every year since that first concert, he has expanded the dimensions of the event, from working with a multitude of governmental entities, including the Military District of Washington, National Park Service, and Architect of the U.S. Capitol, to bringing together a small army of savvy television producers and talented artists, many of whom essentially donate their time and efforts to bring the concert off. He has been quoted as saying: “You have to juggle a lot of hats when you do this,” referring to the myriad of roles he fulfills throughout the year and especially in the final staging of the event. Over the years, the event has also reflected the broader context that frames the music. In the 1980s, as the first concerts were staged, the technical underpinning of the Capitol Fourth evolved and expanded. Better broadcast and filming equipment emerged as well as improvements in sound and recording. In the early 2000s, weather conditions, always a potential problem, led to a larger and more protected performance shell, erected each year in late May for the Memorial Day Performance, also staged by Colbert’s non-profit organization, and ready for use again five weeks later. The long list of well-known MCs and both emerging and established performers have documented the changing tastes in popular music while, at the same time, providing for new ways to perform the traditional patriotic melodies that are at the heart of the show. In 2002, new security procedures were adopted in light of the 9/11 tragedy. Finally, by 2012, the size of the live audience and that of national viewership elevated the Capitol Fourth to first place as the nation’s largest combined audience to attend and view by telecast a live performance, a ranking it continues to enjoy today. As the nation has changed and evolved, so has this remarkable event over the last three decades. In brief, this is the story and the history, but what do you personally remember about the Capitol Fourth concerts? The Blog of History is interested in hearing from you. We welcome any thoughts and, if you wish, any statement on how the music and fireworks have enriched your own understanding of the Capitol Grounds as a venue for celebration. We look forward to your comments. 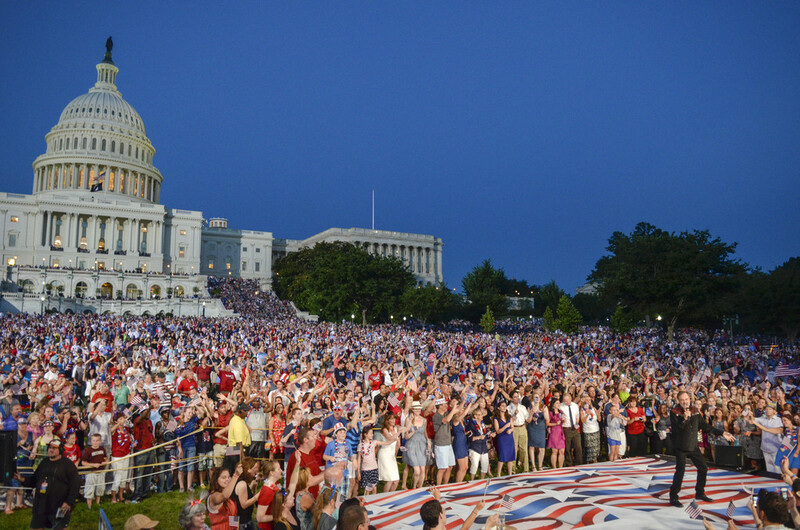 Note on Sources: There is a wealth of material on the Capitol Fourth concerts on-line. The Capitol Concerts, Inc. website provides good information on the event at http://www.pbs.org/a-capitol-fourth/home/ and the biographical sketch of Jerry Colbert found on the Faith and Politics Institute website at http://faithandpolitics.org/jerry-colbert/ provides an interesting perspective on the man behind the event. Rebecca Smith provides background on Colbert at http://magazine.holycross.edu/issue_42_3/42_3_colbert?page=2. Finally, the historical background on July 4th musical performances has been explored by James R. Heintze, American Musical Life in Context and Practice to 1865 (New York: Garland Publishing, 1994). Heintze’s on-line chronology of July 4 musical performances is accessible at http://www1.american.edu/heintze/music.htm. It was a moment born of war and remembrance. 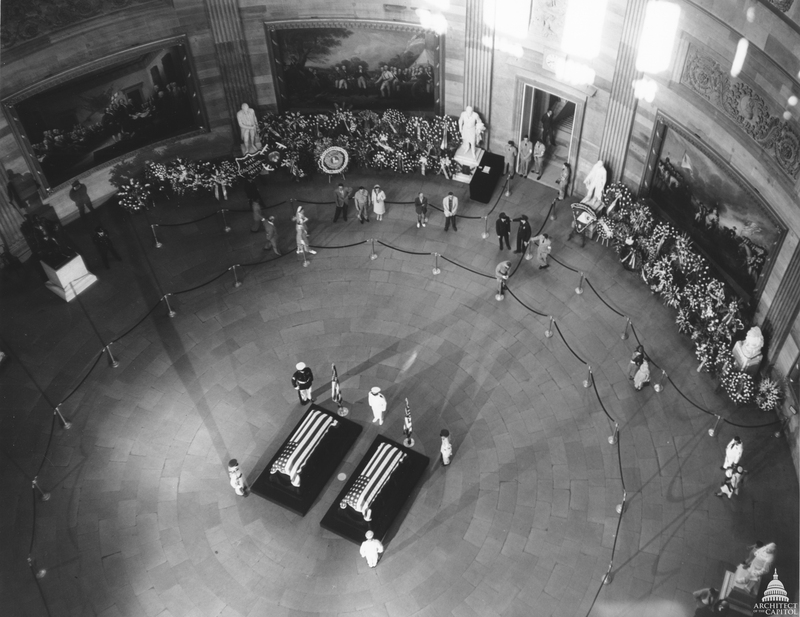 Two flag-draped caskets, side by side, rested on black catafalques in the filtered light of the Capitol Rotunda. Long lines waited patiently to view them. Many of those who passed by must have thought of Pearl Harbor, Normandy, Iwo Jima, Chosin Reservoir, Inchon Landing, and all who had died in those and other battles during the preceding years of war. 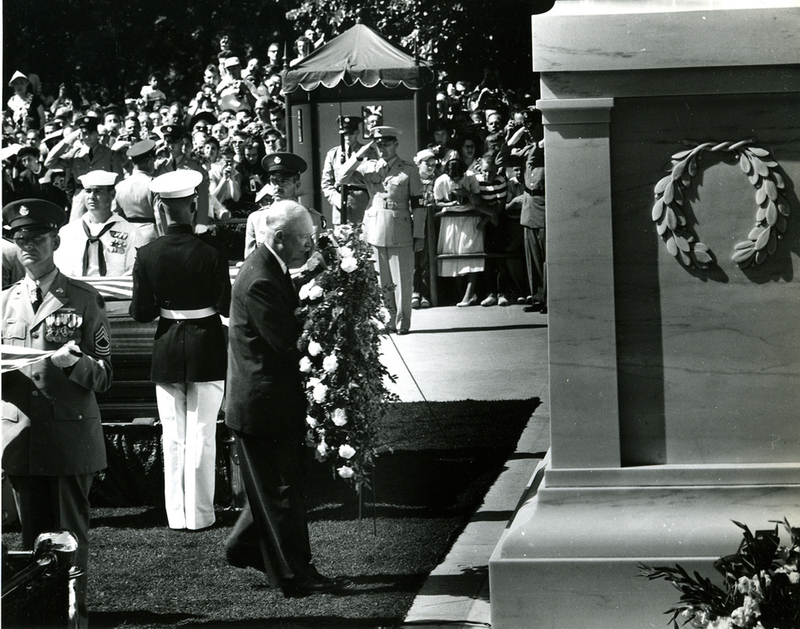 Fifty-six years ago, during the last days of May, an event filled with poignant emotion unfolded in the Capitol Rotunda when a special tribute honored two unknown soldiers who had died serving their country during World War Two and the Korean War. As Congress had done in 1921 when a single unknown soldier laid in state in the Rotunda and was then moved to be the first so honored in the recently constructed Tomb of the Unknown Soldier. This time the site hosted two individuals who had lost their lives in battle, their identities “known but to God,” as stated on the Tomb. During a three-day period lasting from May 28 to 30, 28,000 people passed through the Rotunda, over 6,000 arriving the morning before burial. At 1 p.m. on May 30, a funeral procession bearing the two caskets began the slow march to Arlington National Cemetery where burial would occur in the Tomb of the Unknown Soldier. This began the process that would expand the memorial to one representing more than just those who had died in World War One. The site had also earlier become a place of memory for those who had died during the Civil War and the Spanish-American War. The 1958 funeral cortege included military units and featured President Eisenhower and Vice President Nixon, along with members of Congress and the Supreme Court. The estimated 100,000 who lined the streets grew silent as the procession passed. “Men bared their heads. Many men and women wept,” noted one newspaper account, as it “appeared from interviews that hundreds of bereaved parents and relatives of war dead had come here in the belief that perhaps the two unknown servicemen were theirs.” Warm temperatures marked the day and the final ceremonies movingly affirmed the significance of the burials. Few in the crowds who viewed the caskets fully understood the lengthy effort that undergirded this expansion of the Tomb as a site of national memory. The effort was first authorized in 1946 by Congress as Public Law 429, sponsored by Illinois Congressman Charles M. Price, as a way to honor the fallen dead of World War Two. The long process of choosing two unknowns who represented all the branches of the military and the detailed planning of the ceremonies was further extended by the outbreak of hostilities in Korea in 1950. That conflict, lasting until 1954, led Congress to expand Public Law 429 to include two unknown soldiers who had died during those years. Finally, in 1955, with the selection process completed and the Korean cease-fire line in place, the decision was made to go forth and add the additional soldiers to the Tomb. As in 1921, Americans united around the ceremony and joined in honoring the two lost lives. Later, in 1984, a fourth unknown solider who represented those who died in Vietnam would be added with a similar ceremony at both the Capitol and the Tomb. The act of honoring the military dead has greatly deepened the tradition of lying in state in the Capitol Rotunda. In death, there must be remembrance. In dying for one’s country, whether a President, Senator, General, Civil Rights activist, or a soldier fallen in battle, there is national remembrance. Such occasions, especially those in the Capitol Rotunda, serve to unite us as a nation and transcend the many factors that otherwise might divide us as a society. We are brought together in a public affirmation of national service and individual sacrifice. Note on the Sources: The historical background on the 1958 event can be found in B.C Mossman and M.W. Stark, The Last Salute: Civil and Military Funerals, 1921-1969 (Department of Army, Washington, D.C., 1991), pp. 93-124. The New York Times, May 31, 1958 carried a front-page story of the event and provided important details of the event. A helpful on-line source is the Architect of the Capitol’s “Explore Capitol Hill” and its discussion of “Lying in State,” found at http://www.aoc.gov/nations-stage/lying-state.